Summer RoundUp #5: Soba, Rachel from "La Fuji Mama"
Fresh, joyful, curious, eclectic, with a wonderful family and a deep love and knowledge of Japan and its culture and food, this is Rachel from La Fuji Mama. 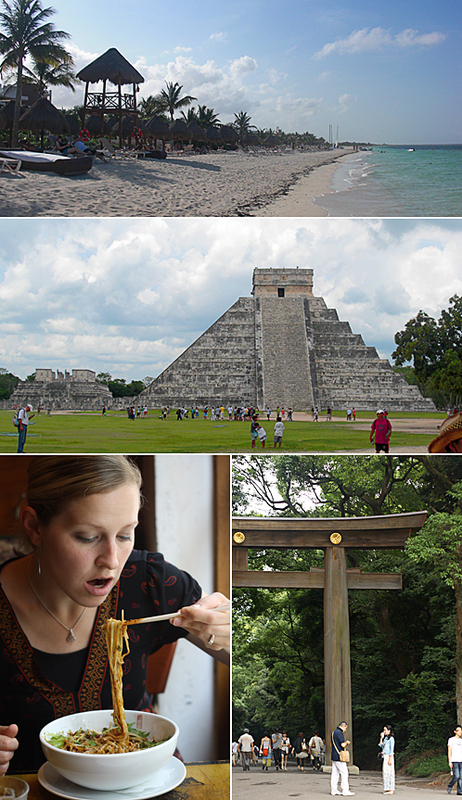 I’ve been reading Rachel’s blog for months now, entangled by her bright and gorgeous photos, her various recipes, ranging from Japanese to Mexican, from Southern American to French. Now, let’s follow Rachel to share her crazy and busy summer so far! This summer has been crazy for our family. We have been all over the globe! In the past 2 months we’ve been to Cancun, New York City, Tokyo, Salt Lake City, and of course at home in Southern California. 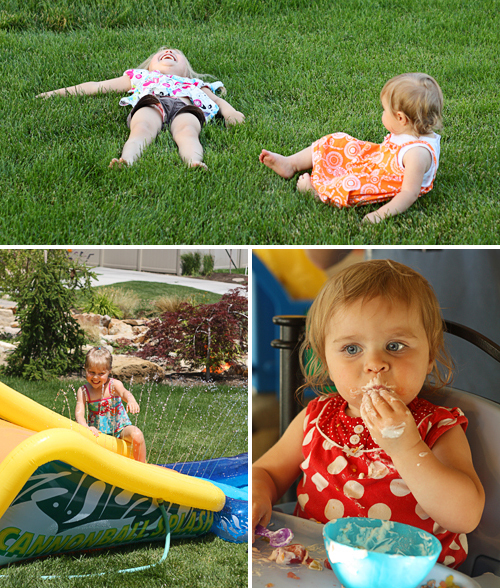 Our summer days have been filled with sight-seeing, good food, time with friends and family, playing in the water, and trying to stay cool as all of the places we’ve been are very hot during the summer! One of the things that I love about summer is all of the wonderful produce available here in Southern California. I recently made a cold soba noodle salad inspired by my recent trip to Tokyo, a recipe for hiyashi chuka in the cookbook Washoku by Elizabeth Andoh, and by some beautiful avocados and ruby red grapefruit grown here in Southern California that I bought at the market. Chilled noodles are a popular summertime meal in Japan where it is hot and extremely humid. The chilled noodles make a perfect vehicle for fresh locally grown produce, are refreshing, and don’t require you to spend hours in a hot kitchen! They make a fabulous summertime lunch for kids, as you can add their favorite ingredients to the noodles and have a healthy, filling, refreshing meal in no time! All you have to do is mix up a simple dressing, cook the soba noodles, and then toss them in a tiny bit of toasted sesame oil. Then you add your toppings and drizzle everything with the dressing and eat! The dressing can be made ahead of time and stored in the refrigerator (up to one week) until you are ready to use it! 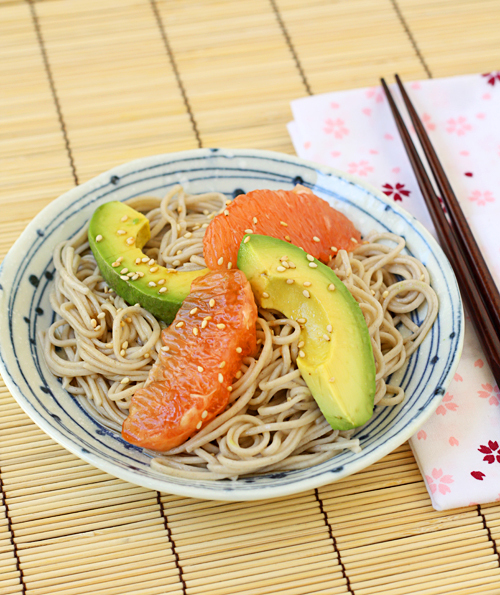 The slightly nutty soba noodles are delicious with the rich and creamy avocado slices and juicy tangy grapefruit segments, making a delicious refreshing meal for a hot and sticky summer’s day. 1. Make the dressing: Prepare the dressing at least 2 hours in advance so that it will be chilled when served. Combine the vinegar and sugar in a small saucepan and cook over low heat, stirring constantly until the sugar has melted. Remove the saucepan from the heat and stir in the soy sauce and sesame oil until well mixed. Transfer the dressing to a jar, close tightly, and shake. Refrigerate the dressing until the noodles are ready to be served. 2. Cook the soba noodles according to the directions on the package. Drain the noodles immediately and plunge them into ice water. Rinse the cooked noodles in a colander under cold running water, gently rubbing them between your hands to remove any excess starch and salt. Drain the noodles then toss them in the sesame oil. Divide the noodles among 4 plates. 3. 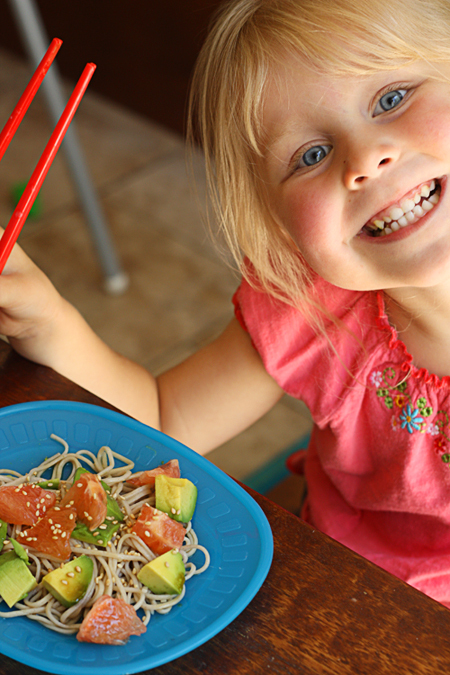 Top each serving of noodles with avocado slices and grapefruit segments, and sprinkle with the toasted sesame seeds. Serve with the dressing. To eat, pour the desired amount of dressing over the noodles and toss to mix. Thank you Rachel for this delicious recipe: avocado is my summer 2010 favourite, can’t try to taste this soba dish as well! rachel, you must have had a wonderful summer at the places you’ve been. I love all products in this recipe, this sounds refreshing for the summer. I love this refreshing dish! What a great combination. Just discovered your blog through Fujimama’s and I love it. 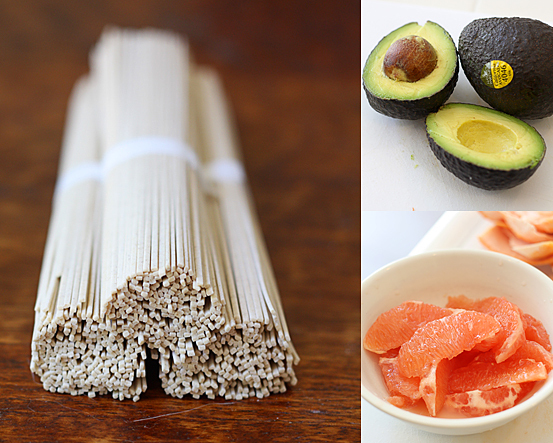 Okay, I’m familiar with chilled soba but adding avocado and grapefruit is something unique! Great dish for a summer. Thank you SO MUCH for having me Juls! I loved this topic. @Anja: Yes! I have had a magical summer! @naomi: Yay! Isn’t Juls’ Kitchen wonderful? @Tanantha: I can’t really take credit for the idea of putting avocado and grapefruit together! It’s a combination that I fell in love with as a little girl. My mom makes a green salad that incldues those 2 ingredients! Thanks for sharing Juls’ Kitchen. Can I just say Ditto…about Rachael, her girls, her blog and then thanks Juls for having her/us! I can do Soba! This looks like the perfect summer dish. I enjoy reading Rachel’s blog to see what her and her beautiful family are up to ! What a busy summer you’ve had, Rachael. This salad looks like the perfect way to beat the summer heat and I love that Squirrel is about to dig right in.